Yoga can help improve your balance on rocky trails. 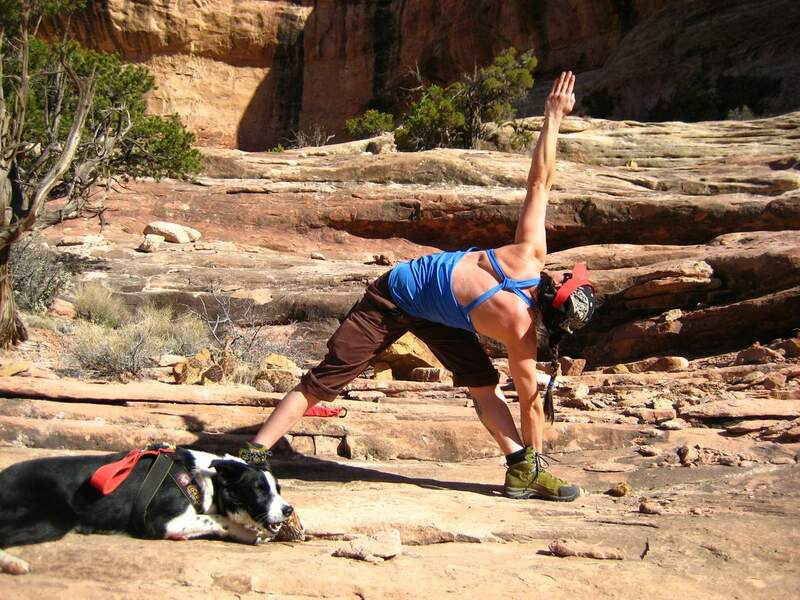 Doing yoga on a hike with your trusty canine companion can be even more fun. San Juan Mountains Association works as the nonprofit educational partner of San Juan National Forest, Bureau of Land Managements Tres Rios Field Office and Canyons of the Ancients National Monument. Our staff members and volunteers work hard to instill a love of nature in people in hopes that they will pass that along. It is generally easiest to instill an appreciation of nature in people who are enjoying themselves. Think about this: The sun is shining, the breeze is just right, you can hear birds singing, the sky is a blazing azure blue, and you dont have a care in the world. This is the state where you are going to absorb the most from nature. Natures lessons are not planned but spring up when you least expect, whether in the form of a mama bear and cub, a tumbling river cascade in the desert or a wildflower you have never seen before. All these experiences are what bring us closer to nature and, in turn, we will seek to preserve nature and, perhaps indirectly, our public lands. However, we all have bad days out there. Some people even have muttered I hate hiking! Rain is stupid! or Im never going camping again!  all such blasphemy potentially is avoided with proper preparation. Preparation for an outing is not just a matter of having the right gear (see the August 2011 Stewards of the Land Column  www.durangoherald.com/article/20110731/COLUMNISTS49/111009999/0/SEARCH/Bring-the-skills-and-gear-to-avoid-getting-lost). Much preparation is an ongoing practice and happens long before the outing. Practice makes perfect. Much nature exploration involves walking around. This, of course, is easier for the more physically fit. Simply walking, hiking or jogging more often will improve stamina. Taking time to do this every day will make those all-day adventures more enjoyable. Colorado goes up. Many people hate going uphill. Well, guess what? Colorado goes up ... up and up. Hills happen here in the San Juan Mountains. The best way to acclimate to going up is to practice going up. Avoid hunching forward. Keep your body upright and you will make better use of large muscle groups. Imagine that a rope around your waist is pulling you up the hill. Also, simply accepting the fact that hills happen, instead of fighting the hill, will make it easier. Dont bonk. A couple autumns ago, I was hiking down to camp in Lower Ice Lakes Basin after climbing Fuller and Vermilion peaks. The views from these peaks are exquisite, breathtaking  worth the effort and then some. I was less than a mile from camp when I became tired  very tired. I sat down on a rock and wanted to stay there. I realized that I hadnt brought enough food. Although I had rationed my calories throughout the day, it wasnt enough. My body was depleted. I sat down a few more times before slowly plodding into camp. Then I ate and ate and ate some more. When you are active, you need to eat more. Remember to take breaks to eat, to drink and to take in the scenery. You will improve your endurance, and you may notice something you might otherwise have missed. Find physical balance. One of the most important factors of balance in the backcountry is balance itself. Balance equals confidence when hiking on tricky terrain. I used to have such poor balance that my friends nicknamed me Walking Disaster. Consequently, I did not much enjoy hiking on uneven or exposed terrain. Since then, two factors have greatly improved my balance and confidence: yoga and trekking poles. Yoga can improve anyones state of mind, if practiced properly. This can give you more confidence. It also can greatly improve balance. For one thing, it strengthens your balancing muscles  abs, back, hips. Also, if you practice standing on one foot while holding the other above your head or twist your body into an eagle pose, the simple act of crossing a stream on rocks no longer will seem so challenging. Crossing a stream on rocks also can be 10 times easier if you use trekking poles. In addition to assisting with balance, poles can increase uphill momentum by incorporating upper-body muscles and can ease shock to knees on the way down. This is important because, well, Colorado goes up. And what goes up must come down. Now go out and absorb the natural beauty of the San Juan Mountains. What pleasant surprises they have in store for you  that is if you are prepared and balanced in your mind and body. MK Thompson is conservation education assistant for San Juan Mountains Association. SJMA is a nonprofit dedicated to public land stewardship and education.